A sunny weekend, but so so cold. That wasnt going to stop us though and another two days of cadet flying! We’ve now awarded 25 sets of wings! Well done all. This Sunday saw the first cadets complete their Aviation Training Packages by flying a conventional glider from Little Rissington since our recent pause in flying. Four cadets completed their Blue ATP courses and will be awarded their wings. The wait is over – now comes the hard work! 637VGS, and ourselves, have now received the permission we have been waiting for – we can now FLY Air Cadets again at RAF Little Rissington. Starting with the Blue and Bronze Aviation Training Packages with Silver and Gold to follow later. Congratulations to Flt Lt Brian House who received an AOC 22 Group Commendation in the RAF New Year Honours List. 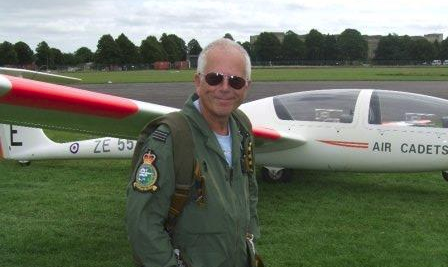 Brian joined 621VGS in 1959 and became the Chief Flying Instructor in 1973 and has been ever since. His dedication to excellence and enthusiasm to training cadets and future staff has been pivotal in 621VGS being awarded the Sir Arthur Marshall Award, The Brietling Trophy and the CFS Trophy. The later was in 2009 with 621VGS having received the first ever “Excellant” rating for glider flying instruction by CFS. Sadly the organization forced 621 VGS to say goodbye to CI Neville Cullingford on Saturday. On his last day as a staff member at 621 he was awarded his long service award by the CO. 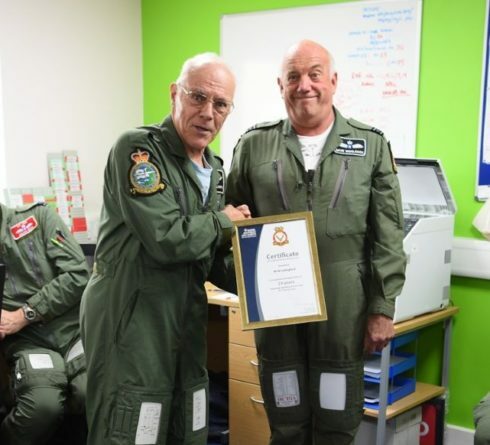 Celebrating 24 years service to the Air Cades with a cake (which certainly packed a punch). Neville, pictured on the left, has been an invaluable member of staff at 621 VGS. Back in 2004 he attended one of the summer courses as an admin officer, he must have enjoyed it as he returned for the following courses until he joined 621 as a CI in 2006. Retrieving gliders, transporting cadets, ploughing through filing, updating manuals through to trawling the squadron archives to get published the squadron history – he has helped with every aspect of the operation to keep us and more importantly the cadets flying. He has dedicated his time doing mostly jobs none of us wanted to do and was always entusiastic about doing it. He will be missed. Despite not being allowed to be a part of the VGS movement, he intends to continue to pass on his enthusiasm for aviation to Air Cadets at a local squadron. We will no doubt see him soon – with cadets in tow. Nev – Thank you for all your hard work and the contribution you have made to 621 VGS. We had a weekend off last weekend as our CGS supervisory staff were away on a expedition to St Athan. This weekend however, the three aircraft flew 77 launches flying just over 10 hours! Whilst we haven’t been breaking any flying records for launch totals with the two aircraft, we have been gaining awards. Well – re-awards of instructor categories. Five of our instructors have now completed the return to flying process with four following close behind. At the moment we are co-located with 637 VGS and their instructors are also getting through their conversion courses as well. There are still more instructors and Graded Pilots to get through the process, as well as some hoops to jump through, before we will be in a position to start providing courses to cadets. That is where we want to be and we are working hard to get there. OK so there’s been no posts for a bit, it’s been a little busy, but this is a biggy…. This weekend saw the return of flying for 621 VGS and 637 VGS. 621 VGS are currently located at Little Rissington operating alongside 637 VGS. This weekend saw the first flights for the two VGS since April 2014 when 2FTS paused all Air Cadet gliding. This is the first step in many before we can start offering courses to cadets – but we will get there! Staff from 621 VGS spent the weekend at Little Rissington, home of 637 VGS, this weekend to start the mandatory ground school training required prior to the VGS to restarting operations. Many of the ground school subjects require annual or bi-annual refresher training. Human Factors, Emergency Egress Drills, Soaring Protocol amongst some of the items covered over the two days. Some of our staff have also restarted their return to flying. Sqn Ldr D Woolcock, Flt Lt T Webb and Flt Lt N Blake have visited RAF Syerston for a week and flown. Flt Lt T Webb, Flt Lt B House and CGI D Melling-Poyser have also spent time their learning about the new Skylaunch Winch. With the move from Hullavington underway, several staff and some VGS friends have been helping box up the squadron kit to store over the next few months whilst we await our new home. 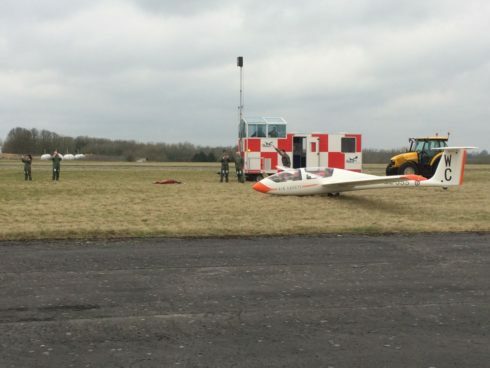 Four of the five aircraft have been moved to Little Rissington to await their turn in the recovery process. 2017 is going to be exciting! 645 VGS have restarted Vigilant operations, starting with staff refresher training, under the supervision of 2 FTS.